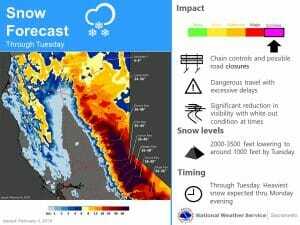 February 4, 2019 – Series of Pacific storms will impact Northern California through Tuesday. Periods of moderate to heavy precipitation with gusty wind and isolated thunderstorms are expected. Drier weather returns by midweek. Flash Flood Watch through this afternoon, Winter Storm Warning until 4 PM Tuesday and Blizzard Warning until 10 PM tonight. Satellite imagery shows the next strong short-wave approaching the Bay Area early this morning with a band of moderate to heavy showers ahead of it moving through the Central Valley into the northern Sierra Nevada where heavy snow has begun at KBLU. Hi-res models bring this heavier band of showers through the valley before sunrise with scattered showers and a few thunderstorms in its wake. 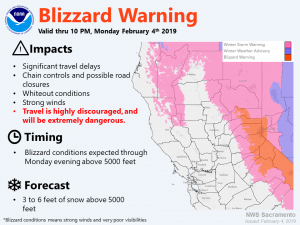 Upslope flow and steepening lapse rates will continue heavy snow over the Sierra Nevada and the blizzard warning has been extended into this evening as the next deeper low drops down the West Coast. 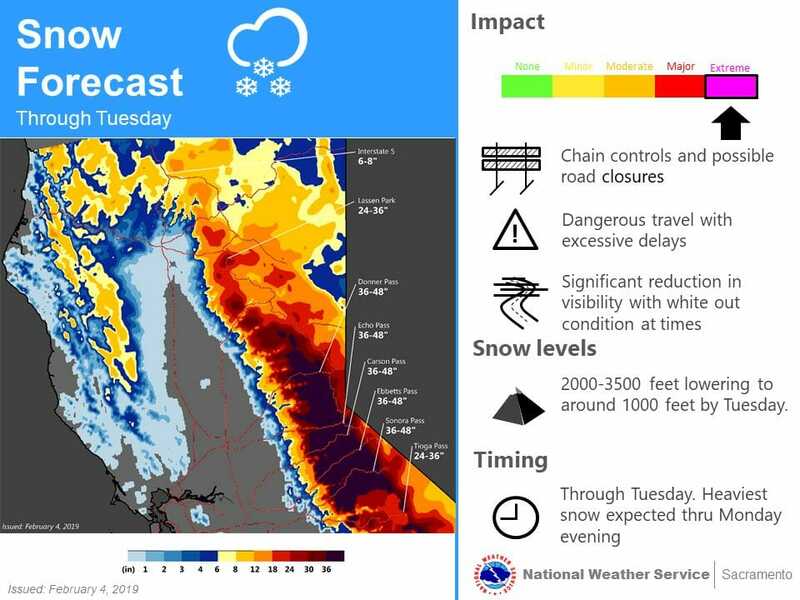 Significant snow will develop tonight in the foothills with heavy snow continuing in the Sierra as snow ratios increase and the snow levels lower to near the valley floor across the northern Sacramento Valley and to around 1-1.5K feet east of Sacramento. Showers end by Tuesday night as subsidence increases and drier northerly flow aloft sets up over interior NorCal. Upper ridging begins to build back inland on Wednesday with dry weather and below normal temperatures continuing into Thursday. Medium range models differ through the extended forecast period leading to low confidence in what will happen. EC showing a deeper upper low approaching the CA coast Friday, shifting inland Friday night into early Saturday. EC portrays widespread precip with this wave, while GFS keeps precip chances confined to mainly Shasta county. Colder deeper low from the north follows for the weekend. EC drives this low into the area for widespread precip, while the GFS tracks the system farther east and keeps precip confined primarily to the mountains of interior NorCal. GFS then progs frontal system into NorCal Monday with widespread precip, while EC keeps precip confined to northern portions of the forecast area. Forecast attm is a blend of the models with chance POPs through much of the extended period.